Geographically variable. Wings are brown. Upperside of forewing has 2 large yellow-ringed eyespots. 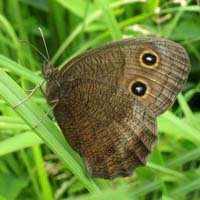 Lowerside of hindwing has a variable number of small eyespots. Southern and coastal butterflies are larger and have a yellow or yellow-orange patch on the outer part of the forewing. Inland butterflies are smaller and have the yellow forewing patch reduced or absent.